This Chicken Scampi Recipe is bursting with flavor from the white wine, sauteed peppers, Italian spices, and rich white sauce. It’s also super easy and quick to make! If you love PASTA, you may also enjoy these pasta recipes. Blackened chicken alfredo– with grilled chicken and, blackened seasoning, and sundried tomatoes. Creamy Riganoti with Chicken and Mushrooms– a creamy tomato basil sauce with grilled chicken and mushrooms. Cheesy Baked Orzo– A quick 15-minute recipe! Spaghetti and meatballs– A classic Italian recipe all made from scratch. This recipe was originally posted on Feb 10, 2016, we’ve tweaked it a bit since then. Dredge the chicken tenders in a combination of flour, salt, Italian spices, and black pepper. Then brown the chicken in a skillet filled with olive oil over medium-high heat. Then remove and set aside. In the same skillet, cook the minced garlic, chopped onion, and bell peppers. Then add the white wine and let it cook out for a few minutes. At this point, go ahead and add the salt and Italian spices. Cook the pasta al dente and reserve 1 cup of pasta water. Then add the pasta water, heavy cream. Bring it to a simmer and toss in the parmesan cheese and cooked pasta. What kind of pasta goes in Olive Garden Chicken scampi? I find that using angel hair pasta works best here. But honestly, you can use whatever pasta you have on hand. What kind of wine is in chicken scampi? Any dry white wine will work in this recipe. I used dry sherry. What kind of chicken is in chicken scampi pasta? Olive Garden chicken scampi pasta uses chicken tenders. If you don’t have chicken tenders, you can always just cut chicken breast into smaller cutlets. 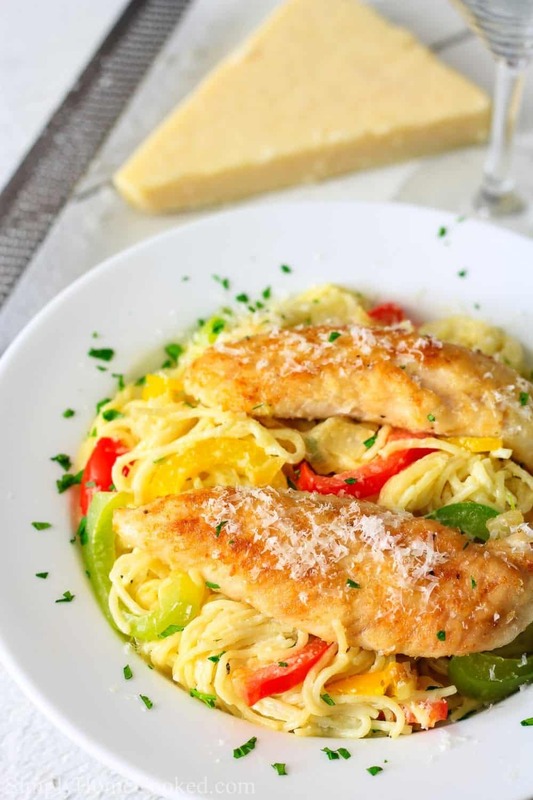 This chicken scampi is a delicious chicken pasta dish that is very easy and quick to make. 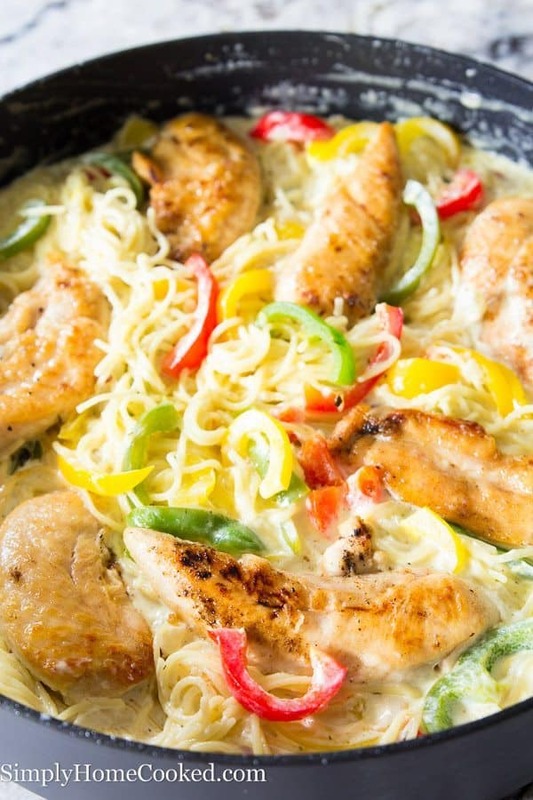 Its loaded with crisp peppers, garlic, and a creamy white wine sauce. Combine 1/2 cup flour, 1/2 tsp Italian spices, 1/2 tsp black pepper, and 1 tsp salt in a flat dish. Heat olive oil in a skillet over medium high heat. Fully cook both sides of the chicken tenders. Remove from the skillet and set aside. In the same skillet, and the butter, minced garlic, and chopped onion. Cook over medium heat until the onion is translucent. Add the green, yellow, and red bell peppers to the skillet and cook until softened. Pour in the white wine and cook it out for about 3-4 minutes. Then add 1 tsp salt and 1 tsp Italian spices. Cook the angel hair pasta according to the package and reserve 1 cup of the pasta water. Add the pasta water and heavy cream to the skillet. Once the heavy cream has warmed, add the Parmesan cheese and cooked pasta. Toss to combine. Ps: We’ve updated some of the photos in this post. Here are some of our old photos. 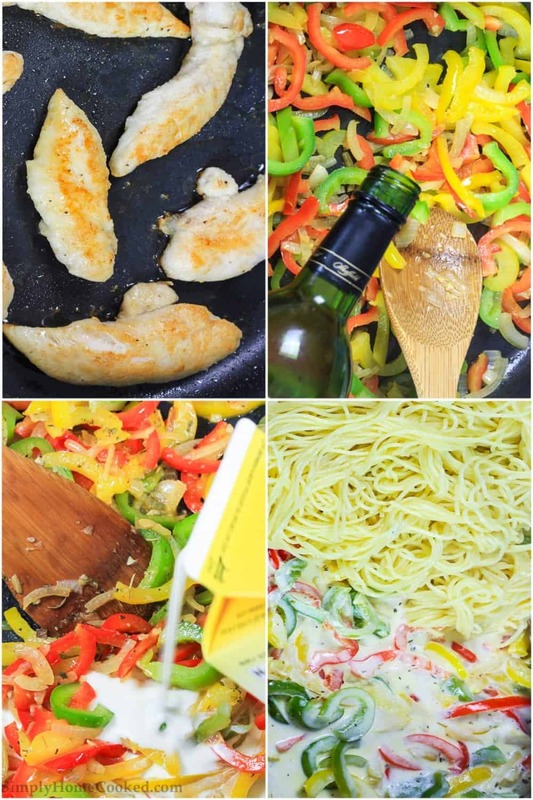 This Chicken Scampi looks like such a treat but also so simple to make, Dina! I am saving this recipe for sure! Thank you, Julia! I know we share an undeniable love for pasta, so I can guarantee that you will love this chicken scampi recipe! LOOKS AMAZING!! I can almost taste the flavors of the sauce and vegetables with chicken. Will be making this when I am craving Olive Garden. Thank you, Valentina! 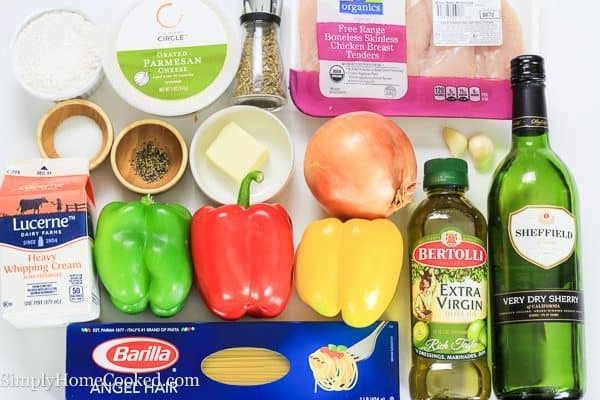 This chicken scampi pasta is our go-to recipe when craving Olive Garden copy cat recipes. I’ve never tried chicken scampi before! This looks so good Dina. I need to make it asap. This Chicken Scampi recipe looks so easy and quick to make. I Love all the other pasta recipes you have linked as well. I need to add them to our weekly menu. Thank you, Natalya! We make this chicken scampi pasta so often, its practically tradition now lol. It’s so good! I like the vegetables mixed with pasta. Oh how lovely! She will love it! 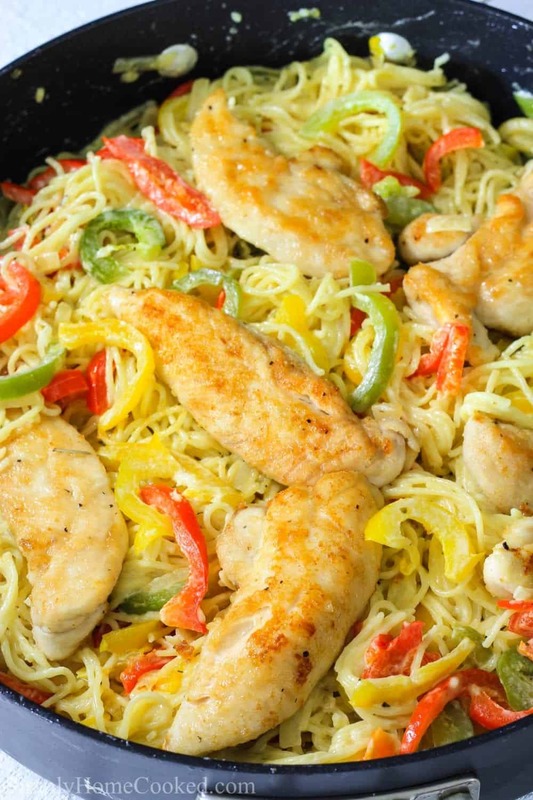 Very delicious,mouthwatering Chicken Scampi Recipe. Love it, very good for a party. My whole family approved it and asked for more???????????? Thank you Liliya! I’m so glad your family enjoyed it ???? Delicious…. Delicious… and once again Delicious. Since we’re not a big fan of angel hair pasta we made substitution to spaghetti pasta. This was really good! I made it tonight for dinner, and the kids loved it too! It looked too good to wait till Valentine’s Day.